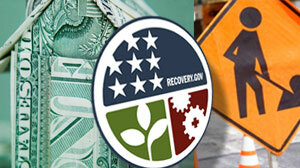 When it comes to stimulus spending, could the wheels of government bureaucracy be grinding too quickly for once? Pound told ABC News the board receives declarations from the recipients - state governments, federal agencies and universities - of stimulus money about what program is being funded. "Some recipients clearly don't know what congressional district they live in, so they appear to be just throwing in any number. We expected all along that recipients would make mistakes on their congressional districts, on jobs numbers, on award amounts, and so on. Human beings make mistakes," Pound said. The issue has raised hackles on Capitol Hill. Rep. David Obey, D-Wisc, who chairs the powerful House appropriations Committee, issued a paper statement demanding that the recovery.gov Web site be updated. "The inaccuracies on recovery.gov that have come to light are outrageous and the Administration owes itself, the Congress, and every American a commitment to work night and day to correct the ludicrous mistakes." ABC News was able to locate several examples on the government's Web site outlining hundreds of millions of dollars spent and jobs created in Congressional districts that have been misidentified. For example, recovery.gov says $34 million in stimulus money has been spent in Arizona's 86th congressional district in a project for the Navajo Housing authority, which is actually located in the 1st congressional district. The reporting problems are not limited to Arizona, ABC News found. In Oklahoma, recovery.gov lists more than $19 million in spending -- and 15 jobs created -- in yet more congressional districts that don't exist. In Iowa, it shows $10.6 million spent – and 39 jobs created -- in nonexistent districts. In Connecticut's 42nd district (which also does not exist), the Web site claims 25 jobs created with zero stimulus dollars. The list of spending and job creation in fictional congressional districts extends to U.S. territories as well. $68.3 million spent and 72.2 million spent in the 1st congressional district of the U.S. Virgin Islands. $8.4 million spent and 40.3 jobs created in the 99th congressional district of the U.S. Virgin Islands. $1.5 million spent and .3 jobs created in the 69th district and $35 million for 142 jobs in the 99th district of the Northern Mariana Islands. $47.7 million spent and 291 jobs created in Puerto Rico's 99th congressional district. Interesting facts and figures, but none of these districts exist. ABC News' Zach Wolf contributed to this report.